We are available to consult with any law firm facing a patent, trademark, copyright, trade secret or other technology law matters. The firm is also eager to hear from start ups, small companies and Universities with IP questions. We feel that it is important to build a network of professionals ready to assist and foster a community of technological and economic expansion. 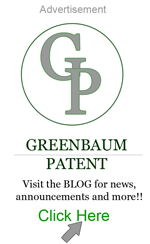 Eric Greenbaum can be reached at 516-304-5048 or at EG [at] greenbpatent [dot] com.